After breakfast this morning we headed across the town square to the tourist information centre to enquire about which subway and bus lines to take to get to the airport for tomorrow. From there we headed back to the church that had the hanging thief's arm so we could go inside and have a look because yesterday we could only look through a window. The interior of the church was very ornate and has a large organ that was playing when we arrived. I snapped a photo of the arm and we were on our way across the river to see the castle. We climbed all the way up the hill to see the castle and the great views of Prague. Unfortunately it was cloudy and hazy. After looking around on our own, we decided it would be worthwhile to pay for a walking tour to gain more knowledge of what we were seeing. We meandered our way back to the hotel to make our booking online. Soon we were off to meet up for our Castle tour. We heard more about the Charles Bridge built by King Charles IV in 1357 to replace the wooden bridge. Apparently his expert stone mason told him if they put eggs in the mortar, the bridge would be very strong so they ordered all the villages to send a cart of eggs for the project. Recently an analysis of the mortar was done and it did show egg protein so maybe it is true. Another centuries old story is about a priest named Jan Nepomuk. King Wenceslas had suspected his wife of adultery. The King ordered the priest to divulge the Queens confessions but he would not. Suspicion grew and the King thought that maybe the priest was the one the Queen was having the affair with so he had the priest thrown from the bridge and drowned. 5 stars appeared in the sky over the bridge that night. All around Prague you can find figures of the priest with 5 gold stars over his head. 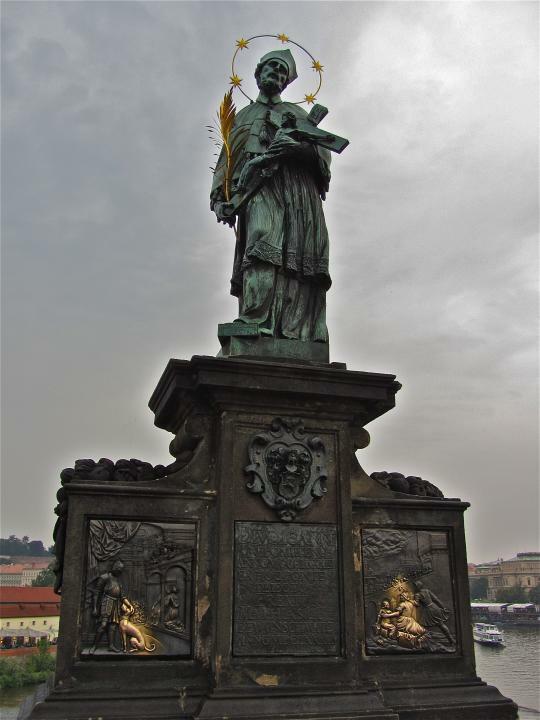 There is a statue of Jan Nepomuk on Charles Bridge with a bronze plaque at the base. If you rub the bronze lady (the Queen) in the figure on the bridge it is said to bring good luck if you rub the dog it is said to bring bad luck. The dark tarnished brass plaque is shiny where people rub both the woman and the dog. Next we visited the Wallenstein Gardens. Wallenstein was the Commander in Chief of the Kings army during the 30 Years War. He had a massive house built like a palace; it even has an owl aviary, peacocks and fish in the ponds. He had a concert hall (which is now the Senate of the Czech Republic) with murals of Greek mythology and garden statues from Greek mythology that were stolen by the Swedes in one of the wars. He only lived in the palace 1 year before he was assassinated. We saw another St Nicholas Church. The same architect built one in Old Town Square and one in New Town Square and gave them the same name! Prague is called the city of a thousand spires and from the hill you can see why, there are spires everywhere. There is one eyesore in the distance, an ugly TV tower built by the Communists as a jamming tower. There is also what looks like a mini Eiffel tower on top of a hill, built 2 years after the Paris tower. We saw the monastery started by Saint Norbert where they brew beer and market it. Next we walked past the former Soviet Secret Police Headquarters and the church where Jan Nepomuk practiced. We saw the house where Mozart lived, and an Italian style of layering wall plaster then scraping which gives the walls the appearance of being three dimensional, it is pretty neat to see. At the castle we saw the changing of the guards, nowhere near the show put on at Buckingham palace. We stopped at a place in the courtyard where, if you stand in a special spot and speak, the sound echoes back to you from all directions. It sounded weird. The Prague castle is the largest medieval castle in the world and was started in year 870 and not finished until 1929, it is basically a collection of many different additions. We saw the well with a birdcage looking device over it which was to protect the water supply from being poisoned by throwing dead animals in. Next was the castles St Vitus Cathedral, started in 1344. It never quite got completed, there are missing statues and blank discs yet to be carved. King Charles IV is buried here. There is a mural on the exterior depicting the Final Judgement and he interior has some nice stained glass. The castle also has an interior jousting hall in case the weather outside was bad, like now, it is raining. It was from this castle that three Catholics were said to have been defenestrated (thrown out a window to death) but they landed in trash and survived sparking the 30 Years war or so the story goes. At the end of the tour Brenna and I found some shelter from the rain in the gardens for about an hour then headed across the Charles Bridge, being careful to only rub the bronze lady not the dog. We had a late supper of pasta and beer near our hotel and called it a night. After Brenna had gone to bed I received a call that Riley was not doing well. Christine took him to the veterinarian hospital and was keeping me posted. Tomorrow we travel to Venice for half a day then on to Rome.